Owner and designer, Alana Ferraiolo wearing a shoulder tie maxi dress from En Creme and a braided choker from jewelry company, Candy Rockz. Stroll down South Broad Street past Snyder Avenue, and your eye catches a predictable lineup of businesses: funeral homes, dentist offices and restaurant after restaurant. It's a delightful surprise, then, when a women's fashion boutique — a young-skewing one, at that — surfaces among them, like a daisy among carnations. 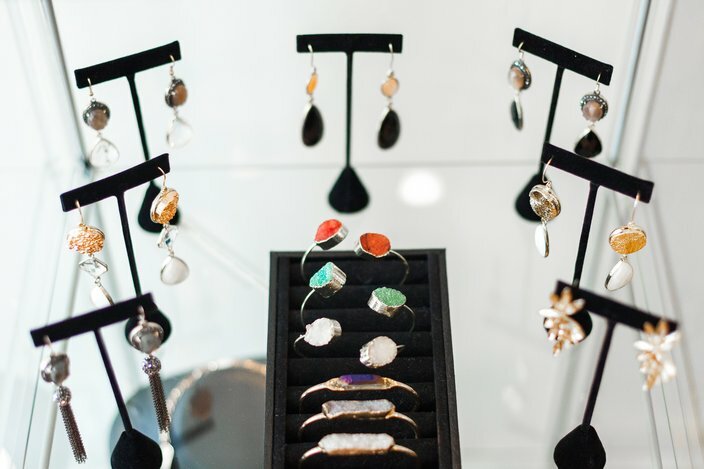 Alana Ferraiolo, a 24-year-old Moore College of Art & Design alumna and owner of Alana Ferr Atelier, opened shop earlier this month at 2403 S. Broad St., just south of Ritner Street. 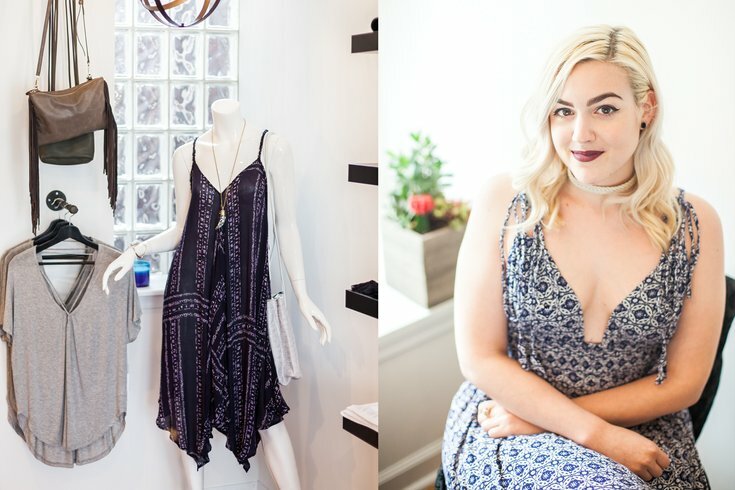 It's a minimalist but trendy 1,200-square-foot boutique that carries an array of California apparel brands (including bohemian-style tops and rompers from Cotton Candy L.A.), designs from Ferraiolo herself and jewelry from Candyrockz Jewelry — an increasingly popular brand based out of Philadelphia. It's a relocation of her previous boutique, which opened last fall and was situated between Wolf and Ritner on 13th. Because that shop was limited to neighborhood foot traffic, and because she required more workshop space, she moved to South Broad Street. "A lot of my customer base is here, and I really felt like I was fine here," she told PhillyVoice. "I don't have a lot of problems." Much of her business, she said, has been through word of mouth — 16- to 40-year-old South Philadelphians coming in off the street and spreading the fashion gospel to friends, or clients she works with for custom orders who report back with glowing reviews. To boot, she noted, she finds it helpful to not be on East Passyunk Avenue, where she felt it was harder to stand out and would have limited her appeal to customers who want to drive, pointing out how off-putting the avenue's traffic congestion can feel to that demographic. Alana Ferr Atelier, 2403 S. Broad Street. Her wares are also mostly affordable. Because Ferraiolo specializes in evening wear with her custom orders, designing clothing for weddings, parties and christenings, her originals can set a customer back $150 to $200. In general, however, tops in the store — which tend toward flowy and "ethereal" aesthetics, she said — won't set you back more than $60 or so. Accessories, too, are fairly affordable: one Candyrockz bullhorn necklace costs approximately $30, while sunglasses with a cat-eye flair ring up for $28 to $32. 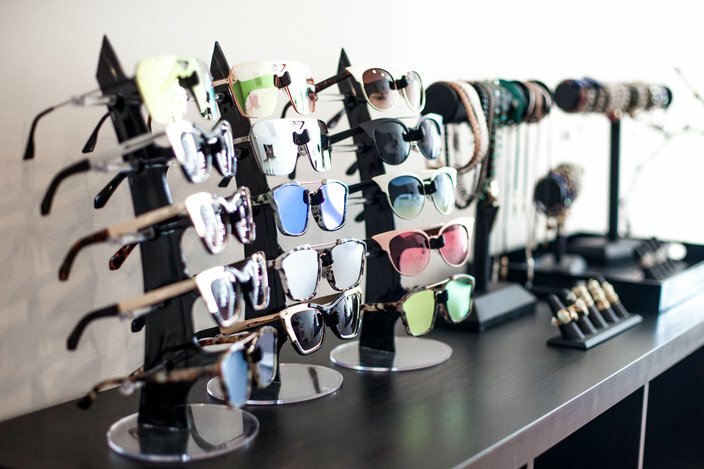 In addition to clothing, a wide range of sunglasses, jewelry, accessories and bags are available at Alana Ferr Atelier. "We're affordable; we're reasonable. That's one thing people really don't realize," she said. "And I have a lot of different pieces that I think a lot of people in South Philly will like. Because people in South Philly, they like that — to stand out and be different." Alana Ferr Atelier is open Monday through Friday, from noon to 7 p.m, and Saturdays from noon to 6 p.m. Though, the store will be closed on Mondays throughout the months of July and August.